Amanda Brissenden, PhD Candidate in Chemical Engineering and winner of this year’s Three-Minute Thesis (3MT) competition at Queen’s University joins us today. Brissenden discusses her research inspirations, process, and achievements thus far and sheds light on her experience with and participation in the 3MT competition. Brissenden will be competing April 17th 2019 at the provincial 3MT competition hosted this year at McMaster University. Good luck Amanda!!! 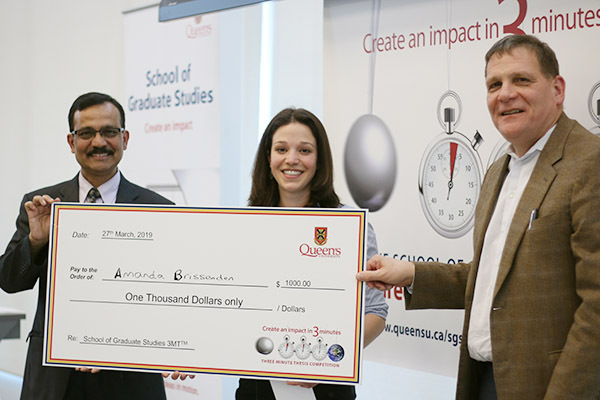 Photo courtesy of the Queen’s Gazette featuring Amanda Brissenden (centre) with School of Graduate Studies Dean Fahim Qadir (left) and Principal Daniel Woolf (right) following her 3MT win at Queen’s.